These two interactive visualizations has been in the drawer all summer. I made them in June already and did a small effort to get them published, but then I when that didn’t happen they were sort of forgotten about. The starting point was the campaign funding data that was published after the parliamentary elections here in Finland. All MPs have to publicly declare all donations above 1500 euros. The data can be found here, or in a slightly refined form here (thanks Helsingin Sanomat!). 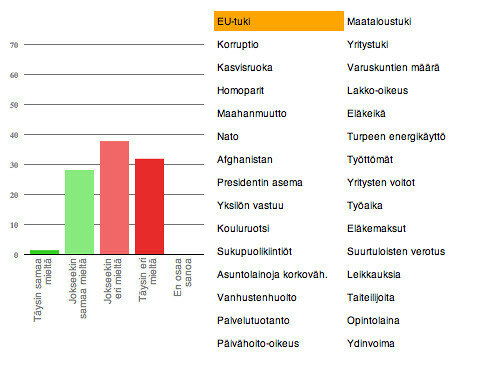 Helsingin Sanomat has already provided their own visualization, check it out here. Click to open in new window. Note that it takes a while to load. The network approach above might be pretty, but not as informative as it could be. Again I used Protovis to build an interface that quickly lets you browse through all the reports. Click to open in new window. The explorer itself is in Finnish. 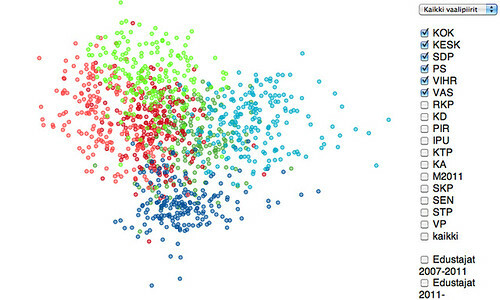 I think this visualization has a lot of strengths. It is “click-less” which means you can quickly browse the candidates. Life is too short to be clicking. The loading time is also much, much shorter than in the network visualization. Yesterdays elections turned out to be even more exciting than everyone had expected. True Finns shocked everyone with their third position. Trying to get a government together now is not easy. Application opens in new window. Requires an updated web browser. Campaign funding: How much do know? The number one political scandal in Finland during the past few years has been about campaign funding. Especially the Center party has been exposed to a lot of criticism due to its incomplete accounting of the campaign funding. The legislation has been tightened and today every MP has to disclose every campaign contribution over 1.500 euros. But has this really made the political system more transparent? As you can see the campaigns are mostly paid from the pocket of the candidate. The average candidate spends 7.275 euros on the campaign (of which 3.379 euro is own money). 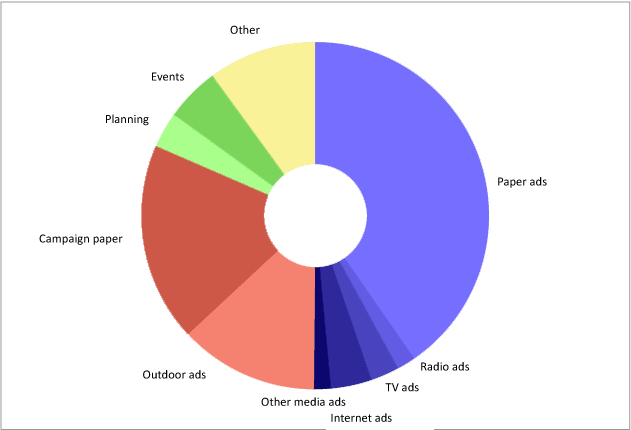 Mostly on advertisement in newspapers (2.838 euro in average) and outdoors (910 euros). And also on printing own campaign papers (1.297 euros). This is all interesting, but does not really answer the initial question: how transparent is the campaign funding? Do we know who is paying for the campaigns? Answer: merely a part of it. 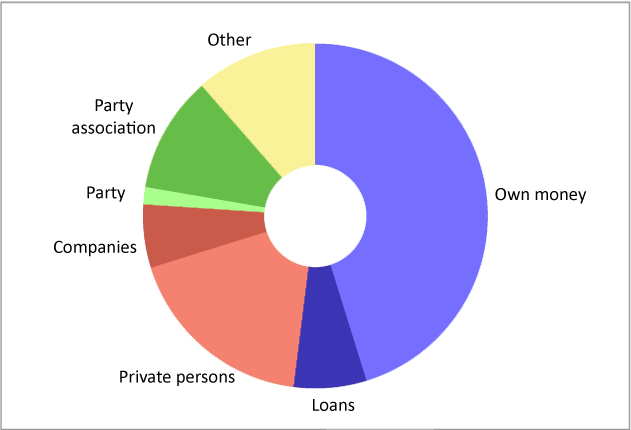 Only 30 percent of the support given from companies, associations and private persons is publicly disclosed, mostly because many of the donations do not exceed the 1.500 euro limit (in some cases smaller donations are also disclosed). But 70 percent of the support come from unknown actors. Not the transparency one would expect after the scandals that we have been through. Get the data (Google Docs). 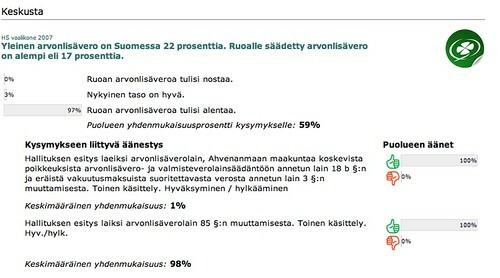 There seems to be something fishy with at least part of the data on Puolue ja vaalirahoitusvalvonta. When you list donations according to size Sauli Sakari Ahvenjärvi gets both a 39.000 euro donation from the district association of his party (KD Satakunnan piiri) and a 15.000 euro donation from the party. However, the latter is not account for in his own report. Note that this is all based on volonatary accounting. The majority of the candidates has not said anything about how their campaigns are financed.